Palika Palace Panchkuian Road Delhi is most famous for Temple especially for wood Temple this is very near to the metro station Ramakrishna Ashram Marg. New Delhi this markets closed only on Sunday you can come here on any day you can get all types of furniture including wooden Temple there are so many types of Temple more than 200 types of temples are available. The variety and the designs are really attractive you can buy in wholesale rate the cost is obviously low in comparison to other wholesale market you can book your wooden stuff from this market and you can get it deliver also in all over India. 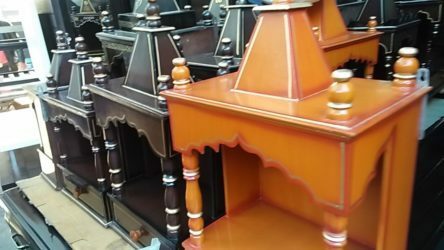 transportation facility through all over the India is available visit this market if you want to buy any types of furniture either wooden or metallic furniture . There are so many mattresses also available in this market so all together if you will talk about furniture market this is the best market for you can buy in retail also and Wholesale also there are so many manufacturer of wooden box is available in this market. You can buy from there you can also book some special design if you have you can book your design and Duke will get the same design within the Limited period of time so this is the best market and best place to buy Temple . So if you are planning to buy wooden Temple this is the best place come here and watch by yourself go to 45 shops talk to them try the rate and see the variety and if you get your desired for it then buy it for your homes.